Arya is blind, Daenerys is captive, her alpha dragon, Drogon, is licking his wounds, Cersei is bald, Tyrion is still drinking, Jon Snow is still dead and Winter Has Come, dragging White Walkers with it. Just another day in the neighborhood in the Land of Ice and Fire. I say we set flame to some booze and prepare for war. DIRECTIONS: Soak the lemon wheel, lime slice and raspberries in some 151 rum. Fill a cocktail shaker with ice then add the ingredients and shake to chill. Strain into an ice filled glass then add the garnishes. Turn the bar spoon upside down over the top of the drink then slowly pour the Bacardi 151 rum over the spoon back so it will layer on top of the fruit and cocktail. Carefully* set flame to the 151. Enjoy the spectacle of the blue flames for a few moments then lay the plate over the drink and EXTINGUISH FLAMES BEFORE DRINKING! Insert straw and serve. If you allow the drink to flame for too long you could heat the glass and the top layer which could burn your mouth even after the flame is extinguished so exercise caution and serve with the straw. Yes, I used my silver Julep cup again. Sadly, I don't happen to have a great Medieval tankard laying around. 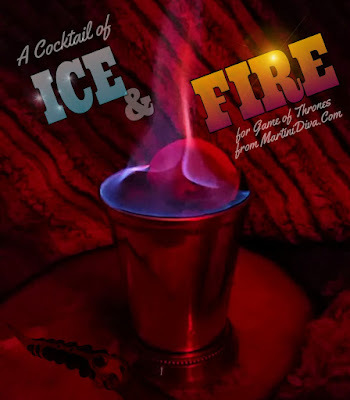 *Flaming Drink Precautions Before lighting the cocktail on fire, have a fire extinguisher at hand, move all the spirits away, wipe up any liquor spills, wipe any residual alcohol off your hands, make sure you're not wearing loose clothing or have any napkins, towels, etcetera that could be exposed to the flame. Do not blow out or slap out the flames as the burning liquid could spill out and spread the fire. Use common sense and do not attempt to flame any cocktail while drunk! Like blueberries? You're going to love this cocktail if you do. It's ripe with fresh blueberry juice and gets a nice kick from blueberry and vanilla vodkas and a little zing from some orange bitters. This is a drink loaded with antioxidants from all the fresh blueberries and the perfect way to put a little healthy into your happy hour. When I bake a blueberry pie I always use a little lemon juice to brighten up the flavors so I added a bit of fresh lemon juice here as well. 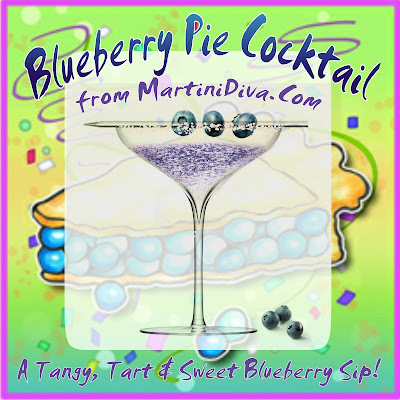 The pie crust rim ties it all together and gives you a true blueberry pie experience in a glass. DIRECTIONS: Juice the blueberries. Sprinkle with sugar then blind bake up one sheet of Pillsbury pie dough. When cool, crush up in a small plate. Add some of the blueberry simple syrup to another small plate. Dip the glass rim in the syrup then into the crushed pie crust then chill the glass in the freezer. (Save the rest of the pie crust for other Pie Cocktails.) Add all the ingredients to a cocktail shaker and shake until chilled. Slide a few fresh blueberries on a cocktail pick and serve. If you're into food holidays, this cocktail is perfect for National Blueberry Pie Day which falls on April 28th. 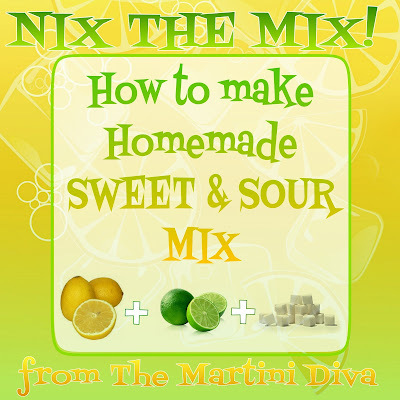 If you do nothing else for your cocktails this year, at least NIX THE (Pre-made) SOUR MIX! I've said it before but it's worth saying again - commercially made, chemical laden, fake flavored cocktail mixes are death to a good cocktail. Commercially produced sour mixes are the reason you never thought you liked a Whiskey Sour, an Amaretto Sour or any other cocktail that calls for citrus and a sweetener. Like your food, your cocktails were never meant to have ingredients you couldn't pronounce in them. It really doesn't take that long to make a fresh, nutritious homemade sour mix and the difference it makes in the taste of your cocktails is amazeballs. Now, go get some REAL lemons and limes and do yourself and your cocktails a huge favor. While your simple syrup is cooling, juice, then strain out the pulp from your lemons and limes. (If you're using a centrifical or cold press juicer you won't need to strain. If you using a hand juicer you will need to strain.) Pour the fresh juices into your storage bottle then add the simple syrup and give it all a good shake. This should keep refrigerated for up to 2 weeks. Toss the sour mix when you notice it getting cloudy. If you add the vodka it will keep for up to a month, however it will not taste as fresh. Yes, you can leave out the vodka and cut the recipe. Yes, you can use oranges, grapefruits and other citrus, though you might have to adjust the amount of sugar. Try different citruses for different cocktails. 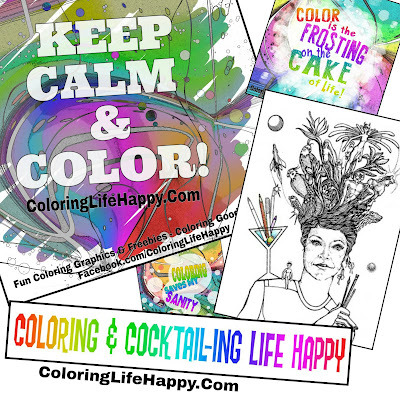 Mix it up, have some fun! No, you cannot use artificial sweeteners. Yes, you can use honey or agave syrup but you'll need to adjust the water amount. And remember that honey carries it's own distinct flavor. P.S. 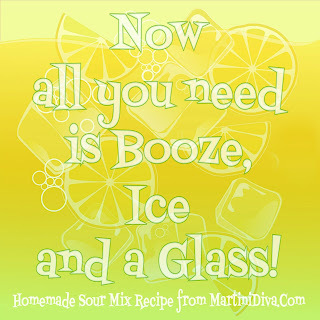 This homemade sour mix is also great in iced tea. "I AM THE SWORD IN THE DARKNESS." Well, Game of Throne fans, here we are. 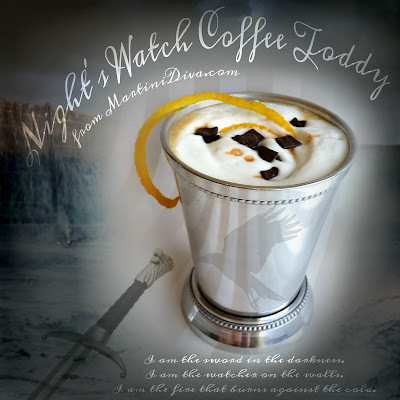 Winter Has Come to the lands of Ice and Fire, the White Walkers have breached the wall separating them from The Seven Kingdoms, they're adding to their Wights numbers with each human kill, and the Night Watch is dismally undermanned, unprepared and - for the moment - minus Jon Snow. The Crows are kinda screwed and so might we all be ... at least at the beginning of season six. The Long Winter has come! What shall we do? 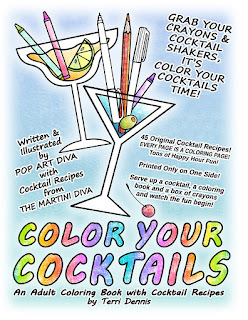 Have a few cocktails, of course! Let's make 'em hot coffee toddys! DIRECTIONS: Pour the rum, coffee liqueur and Grand Marnier into your drinking vessels then add the hot coffee. Foam some milk by whipping on high until the volume doubles then heating in the microwave for 1 minute. 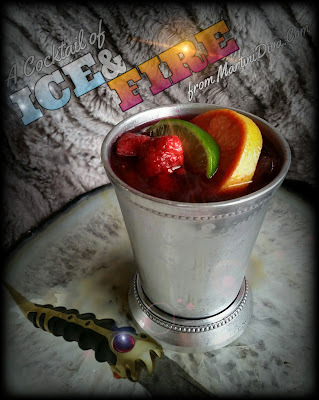 Spoon this onto the top of your toddy then add a few dashes of the bitters, the Dragonglass chips (Alright, already! The chocolate covered coconut flakes! Sheesh, a little suspension of disbelieve here?) 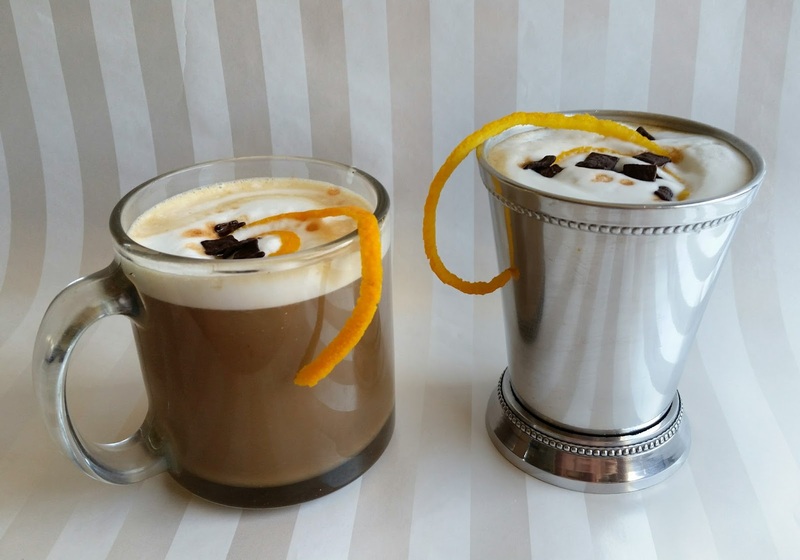 Drape the orange twist on the drinking vessel and serve. 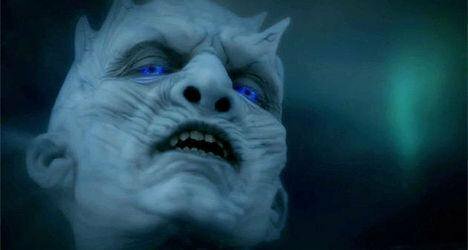 This should put some warmth back into your bones and keep you awake to watch out for that nasty old Great Other worshipping Night's King. To Drink or Not To Drink, THAT Is The Question! 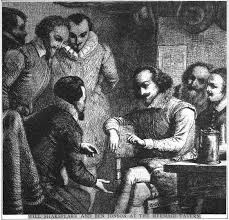 Back in Shakespeare's day, the Elizabethan period, most people drank ale or wine all day long. Why? Because the water was not safe to drink. 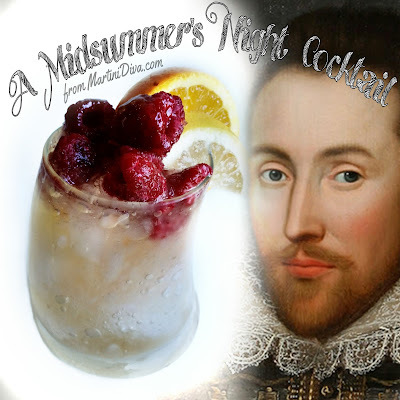 Fermentation kills bacteria , thus, if you wanted to live to see one of Shakespeare's plays you didn't drink the non-potable water, you drank booze. The most popular wine of the era was a spiced, fermented honey wine called mead. Often fruits were added to the fermentation process as well. You can make your own mead or be lazy like me and buy some. It's not really that hard to find as mead has made a comeback in today's cocktail world. I bought mine online, Chaucers Mead, at BevMo. DIRECTIONS: Thin the spiced honey with the hot water. Fill your glass to the top with crushed ice. Pour in the mead, lemon and orange juices, give the cocktail a quick stir then top off with the soda. Pile on the fresh raspberries, add the lemon and orange garnishes to the rim then drizzle the honey over the raspberries and serve. What's a piece of cheesecake without some cherries on top? If you're going to go for cheesecake go for broke and add those cherries. 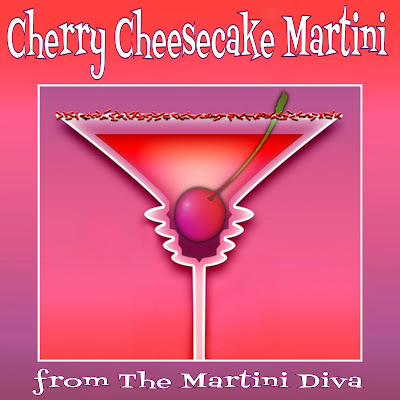 If you really want to go for broke make this Cherry Cheesecake Cocktail instead and drink your dessert! DIRECTIONS: Put some of the whipped cream cheese in the baggie near one corner. Twist the baggie, pushing the cream cheese towards the corner then clip a small hole in that corner to create a piping bag. Pour the red sprinkles onto a small plate. Pipe the cream cheese on the rim of your glass then dip into the red cake sprinkles (jimmies). Chill the glass in the freezer. Add the ingredients to a cocktail shaker filled with ice and shake until chilled. For the cocktail into your chilled glass, garnish with the cherry and serve. National Cherry Cheesecake Day is April 23rd. 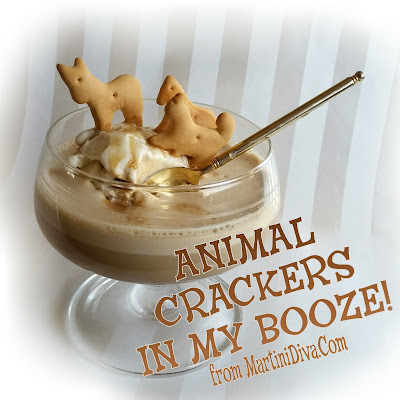 ANIMAL CRACKERS In My BOOZE! Today happened to be National Animal Crackers Day and I happened to have some animal crackers, so, hey, I had to do it. Only instead of making it taste like animal crackers I decided to make it a cocktail I could dunk my animal crackers in ... then I added ice cream and it turned into a boozy sundae ... I'm nothing if not flexible, especially when it comes to animal crackers. DIRECTIONS: Add the ingredients to an ice filled cocktail shaker and shake until chilled. Add one large scoop of the ice cream, tap the coffee bitters on top then stick the animal crackers in the ice cream. Serve with a spoon.